Alaska has been amazing. The difference between the anchorages here and the stops we made on the way up here is incredible. And seeing all the humpbacks and orcas is just icing on the already delicious cake. 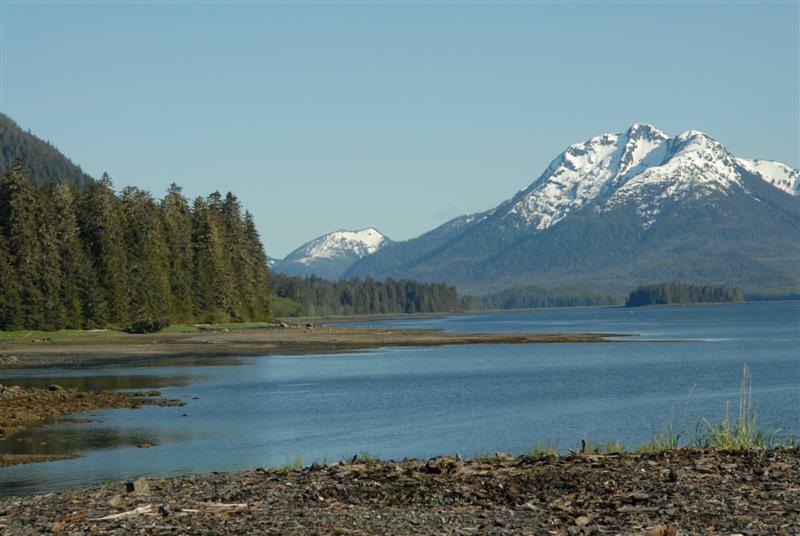 After leaving Ketchikan we transited the Wrangell Narrows up to Petersburg. It was one of the passages I’d been worried about while I was trip planning. We have to share a 22′ deep, 300′ wide channel with the commercial traffic. There are 53 buoys in the 23 mile passage. You begin near the end of the flood tide and ride the current to the middle of the channel, then hope you timed it right and when the current changes to an ebb you ride that back out to the other end. Petersburg was a nice little town at the end with very friendly folks (and no cruise ships) who still earn a living in the commercial fishing trade. We made a quick overnight stop to get water and headed north again in the morning. The next two stops were beautiful. Portage Bay had miles of beach to walk. Sanborn Canal was a quiet little cove where we hid out from a passing low pressure system. It had a stream at the head that we explored in the dinghy (and rain) for a mile or more hoping to spot some moose or bears – but no luck. The boat that was in there when we arrived was Wandr’n Star – it had been across the harbor in Point Hudson from us all winter long. Gary & Dorothy are also headed to Mexico via Alaska. “Go slow, don’t hit the big ones, and don’t back up.” That was the advice given to me on the VHF yesterday by the commercial tour boat coming out of Tracy Arm as we were headed in. We had Tim & Cindy and Gary & Dorothy on Yohelah, and everyone but me was on the bow pushing ice bergs (bergy bits) away with pike poles and boat hooks as I drove through them. Exciting? Absolutely! And the reward was good; South Sawyer Glacier was spectacular. We were still a mile away from the base of it when we turned around, but that’s as close as we were willing to push to as the ice kept getting thicker and thicker. Now we’re on to Juneau in a couple of days (where I’ll send this update from). 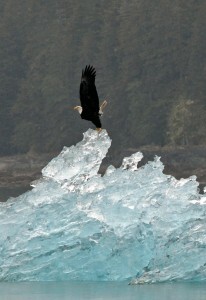 Then to Glacier Bay on Tuesday for our up close and personal visit with the glaciers. 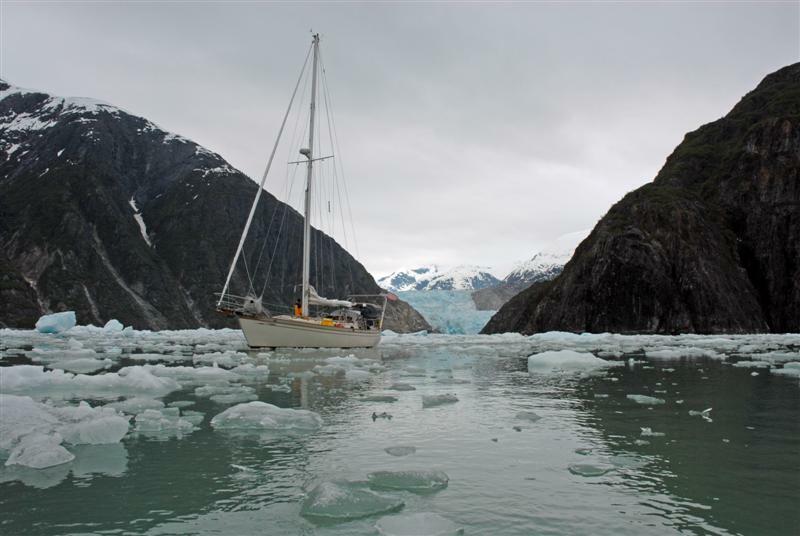 The ice in Glacier Bay shouldn’t be packed in like it is in Tracy Arm, so we can get closer and see the glaciers better. And we’ll get the kayaks out and do some paddling if the weather’s nice. After that, we just don’t know yet. We want to make it to Sitka. Our friends Steve & Elsie are enroute headed this way and we want to catch up with them at some point. But what we will know is that we’ll be officially headed south!